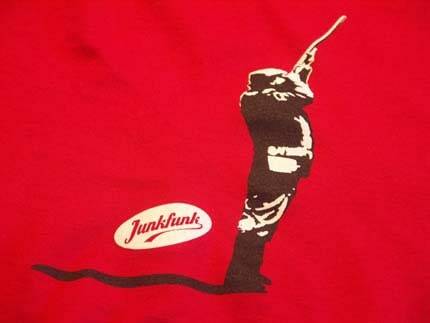 I hadn’t heard of Junkfunk (a UK tee label based in the fashion hotspot of Brick Lane) until I got an e-mail from them asking if I wanted to review a tee. 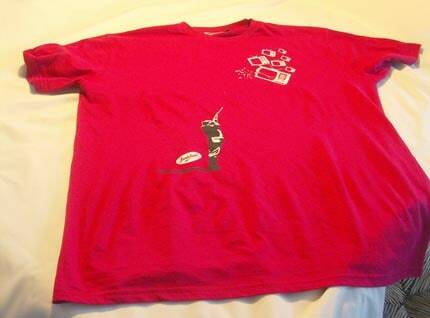 So I looked at their designs and decided that yes, yes I would like to review one of their fine tees. And yesterday morning it arrived, along with a lovely hand written note and a promo sheet of their goods. 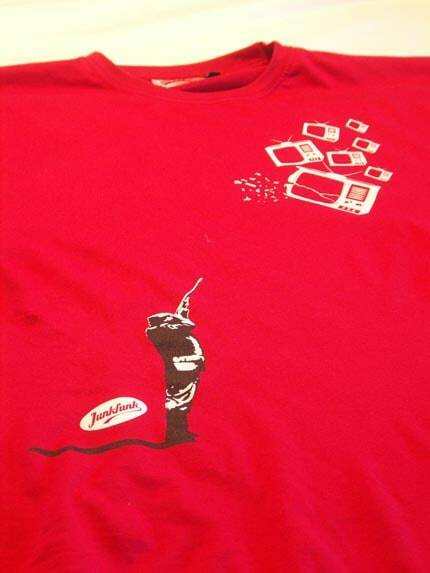 The tee itself is the red version of ‘Shooting T.V.s‘, it is also available in grey but I’d say that the design would pop out more on the red. 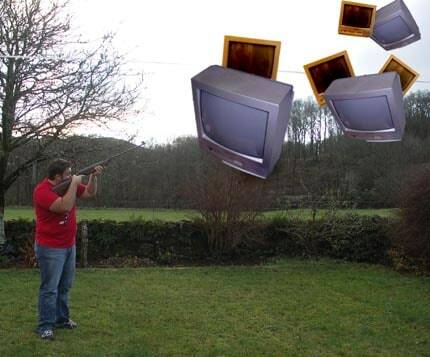 The design wouldn’t feel too out of place on a site like Fullbleed, despite the very English looking gent taking aim at the defenceless TVs. The two visual styles (the photo style of the person and the 50s-inspired illustration of the TVs) are quite an interesting choice, perhaps its to emphasise oddness of the image, or maybe its a comment on how some people believe that television (especially American imports, which I love) has eroded a sense of traditional Britishness, which the shooter clearly represents. 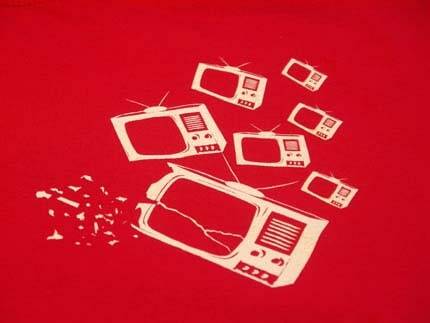 Ok, social theorizing over, let’s talk quality. 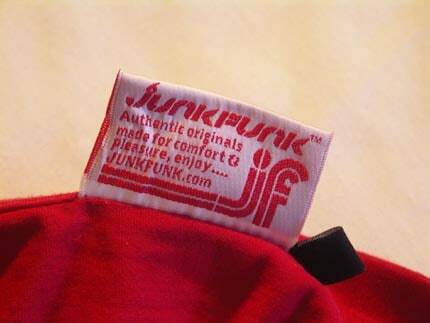 The tee is soft and flatteringly elastic, it might be American Apparel (as they proclaim that “we source our blank T-shirts from ethical non sweatshop suppliers”) but it’s fairly hard to tell since they’ve replaced the tag with a custom one. 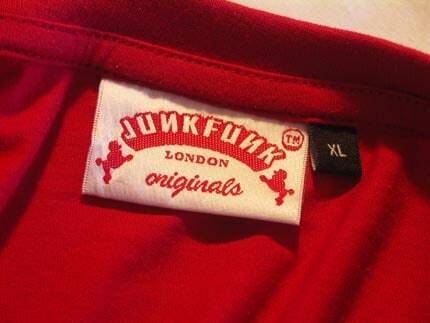 At Â£22-26 for a tee the strength of the pound against the dollar may put off US visitors from making a purchase, which is a shame because Junkfunk are easily competing with the more well-known American labels in terms of design and quality. Though they are still cheaper than some of the mainstream UK labels that are producing designs of a similar style. I’m pretty sure that their size chart is done by AA as well. The collar and cut feel like AA, too.